On Sunday (30 September) there will be celebrations for the Moon festival. The Moon festival (also known as the Moon Cake Festival and the Mid-Autumn Festival) is a Chinese festival held on the 15th day of the 8th month (of the Chinese Lunar Calendar) and it is always held at the time when the moon is at it’s fullest and roundest. The festival is celebrated with the coming together of family to admire the bright full moon, the eating of moon cakes and thinking of family who can’t be with you. Over the past few weeks I’ve seen articles advertising moon cakes and then this past week I’ve seen moon cakes all over the place. So in the theme of getting in the spirit and joining the celebration I had my first ever moon cake. 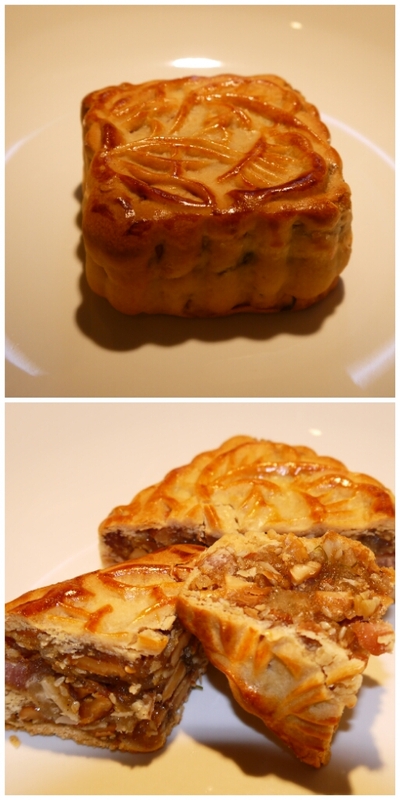 I bought my moon cake at a small bakery on Thanon On Nut. The bakery had cabinets filled with moon cakes but without signs in either Thai or English saying what flavours they were. Luckily for me the bakery owner knew enough English to tell me my first selection was Durian flavoured, (I’m not a fan of Durian), after the bakery owner went off to find someone who spoke a little more English I ended up selecting the one pictured below filled with Nuts and Pork. It was delicious. From what I could figure out it was filled with cashews, almonds, peanuts, sweet dried pork, kaffir lime leaf, crystalised ginger, sesame seeds and encased in a sweet crisp pastry. So on Sunday I think I might head down to Chinatown to join in the celebrations some more and eat more moon cake. Yum! Oh no, stop, stop – that’s TOO delicious. No moon cakes here buddy , dammit.